A new bike lane on Brattle Street by Harvard Square. On Brattle Street’s busiest days, the bicycles used to swim upstream like salmon, headed (illegally) into two lanes of one-way traffic toward Harvard Square. Well, sometimes it was two lanes: Brattle was so frequently crowded with delivery trucks and (illegally) double-parked cars that the second lane was often a theoretical concept. It was, if nothing else, typical: a daily land war for a few feet of asphalt, and a reflection of the clash of car and bicycle cultures that is playing out all over Greater Boston these days. So a few weeks ago, Cambridge set out to stripe a solution onto the contested pavement: a two-directional bicycle lane on a one-way street, separated from traffic by a row of parked cars. And with all the patience and grace for which Boston’s commuters are known, the people weighed in. To call the results “polarizing” would be an insult to poles, whose two ends at least connect somewhere in the distance. Many wrote heartfelt letters of praise and thanks to the city; others predicted a gory apocalypse on two wheels. But flawed though it may be for now, thanks in large part to delays in the completion of the project, it’s also pretty clearly what the future looks like. Fueled in part by a vocal young urbanist movement trying to steer us away from the car culture, bike lanes are taking a cut of more and more Boston-area streets. The aim is an interconnected, comprehensive network that’s safe for bicyclists and pedestrians and doesn’t unnecessarily disrupt vehicular traffic. But even in bike-friendly Cambridge, the road to that goal can be bumpy. On Brattle, business owners have decried the new arrangement as confusing, dangerous, and ugly. It’s true that it has been chaotic at times: With little in the way of signage to dissuade them — and parking meters still in place on the curb — confused drivers pull right into the bike lane and stop there. Anyone attempting to double park will invite the fury of everyone behind them in the only remaining travel lane for cars. Delivery trucks, with only a small loading zone left to supply restaurants and shops, circle the block for an opening. For bicyclists riding outbound on Brattle toward Church Street, peering over a row of parked cars to see if someone driving parallel on the other side is about to turn right and bounce you off the side of a building is not the most secure feeling. Plastic posts and green paint at the intersections still weren’t up, weeks after the initial striping, thanks to unforeseen delays caused by weather and suppliers. Meanwhile, drivers turning right onto Brattle from side streets are not yet accustomed to looking for bikes coming from their right — the wrong way, for cars — and have no signs or green paint to alert them. Hopefully it won’t take quite that long. A series of unforeseen problems led to delays in posts, signs, and some painting. Getting everything in place should go a long way toward easing many of the concerns. Each project like this one — and there are many more on the way, in Cambridge, Boston and elsewhere — can and should help inform the next one. One of the obvious lessons of Brattle Street is that unveiling new street patterns without critical components already in hand can turn people against a project very quickly. 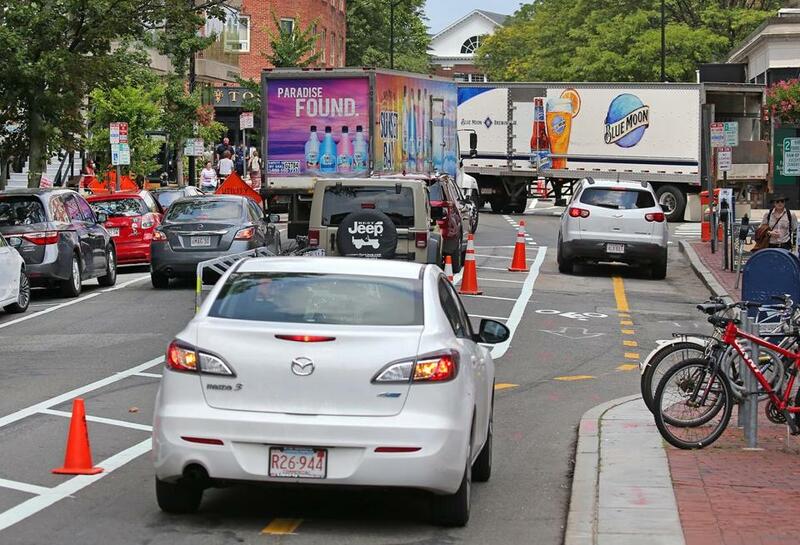 “In an ideal world, if all of it could have been installed at once, that would have been better,” said Jan Devereux, a Cambridge city councilor and bicycle commuter who, until recently, would hop off her bike and walk it down Brattle to get into Harvard Square. “Ideally, it would all happen at once, but life is rarely that simple, particularly when we’re dealing with weather, contractor equipment, and supplier availability,” Joe Barr, the city’s street director, said in an e-mail. Work was scheduled to continue this week. Hurrying is kind of our thing around here when it comes to commuting, but the notion that every new traffic pattern should be immediately intuitive to everyone doesn’t make much sense. Plenty of the roads you’re used to now didn’t make sense until you’d learned their quirks. “We see this all the time, that these projects have an adjustment period,” said Becca Wolfson, executive director of the Boston Cyclists Union. Initial chaos notwithstanding, Brattle Street is a pretty good place to experiment. The cars move slowly. The people — often tourists, particularly at this time of year — aren’t particularly familiar with local traffic patterns, anyway. The old arrangement was chaotic, too: Drivers double-parking and speeding, pedestrians darting into the road, and bicyclists sailing the wrong way down the hill. The only reason that wasn’t confusing? People had years to get used to it. Compared to the old disorder, the changes on Brattle represent real progress — and not just for bicyclists. Slower traffic will make for safer pedestrians and drivers, too. Barr is preaching patience with the project, but Cambridge and other cities installing new and much-needed bicycle infrastructure will need to be patient, as well, working to resolve legitimate concerns without capitulating to over-the-top complaints. John DiGiovanni, president of the Harvard Square Business Association, criticized the process by which the project came about. “The idea that we would move so quickly on something so disruptive without looking at alternatives, while we can have almost a dozen meetings on a fast-food establishment, is a real miss for a city that appropriately prides itself on good process,” he said. But every proposed alternative has its own set of problems, and the city is already showing a willingness to tinker with the plan. They’re considering reducing the time limit on metered spaces near the dry cleaner to 30 minutes, and lengthening the loading zone across the street during morning hours to accommodate truck traffic, while pushing it to times when demand for street parking is low. The only real solution is the same thing that would solve so many of our traffic problems, if we could just force ourselves to do it: Be patient.